With the KYMCO UXV 450i LE, it’s a wild turkey in every pot and a Side by Side in every full-sized pick-up in every garage. Conveniently sized yet exclusively outfitted, the KYMCO UXV 450i LE is powered by an EFI-fed, 443cc compact engine. The UXV 450i LE’s virtue is versatility, facilitated by a shifter gate for solid shifting, and an easy-to-maneuver chassis that it rolls right into the bed of most full-sized pickup trucks. 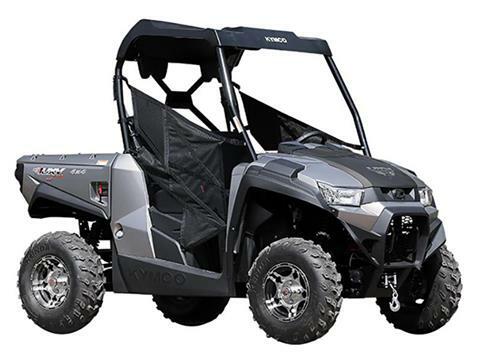 The KYMCO UXV 450i LE’s cab includes a bench seat and tilt steering wheel for fast access in and out of the vehicle. This mid-sized draught horse also features; 440-lb. bed capacity; gas assist, rear dump bed; and built-in tailgate storage. It sits with outstanding ground clearance and class-leading front and rear independent suspension for smooth, sure-footed handling. For rough and rugged terrain, shift from 2WD to 4WD with differential lock.